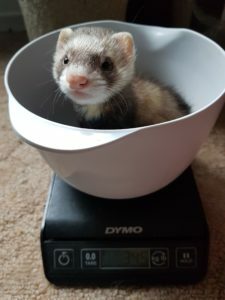 Simon is a baby ferret in need of a loving, experienced home. 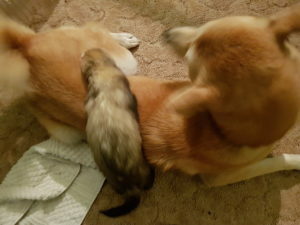 He was born in June, 2018. Simon has a huge heart and a goofy personality. He loves to run around and play and be silly, but he's always very gentle with his people. He hasn't needed any nip training at all! Simon had a tricky start, born at a roadside zoo where he came down with a digestive infection that made it impossible for him to put on weight. He was 365g when he came to the rescue in August, about a third the size he should have been by that age. It was challenging to eradicate the infection, but after several rounds of treatments, he finally started bulking up! 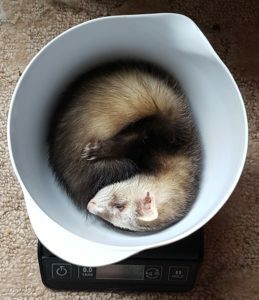 Simon is now over a kilo and is no longer having digestive issues. We suspect he has some minor damage to his digestive tract, causing very low level IBD, so new foods should be introduced with care. He has some supplements that will go with him when he gets adopted, and if he has a flare-up, a dose or two sets him right again. He's doing very well on Wellness Core right now and hasn't had a flare-up in weeks. 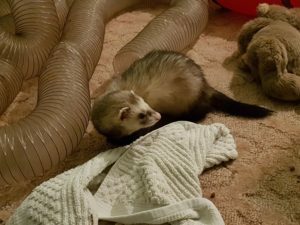 Simon lives with another ferret and a dog who he both adores. 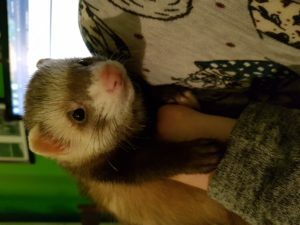 His ferret friend is senior, but Simon is mostly gentle and not too demanding. He and his dog sister will play wildly for hours! 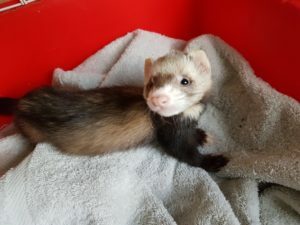 Simon needs a home with other ferrets, or at least other ferret-friendly pets, as he's very active and social and needs a lot of attention and vigorous play. 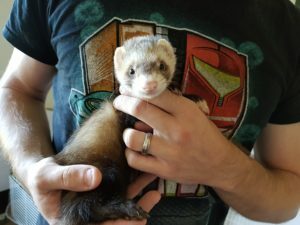 Like all ferrets, Simon needs a lot of time, a lot of cleaning, a lot of food, and will need specialized vet care. Ferrets can live up to ten years, and don't do well on their own or left in a cage. Ferrets like to play very roughly and need friends that are down for some intense wrestling! Simon is available for adoption through Grand River All Breed rescue. The adoption donation is $170. 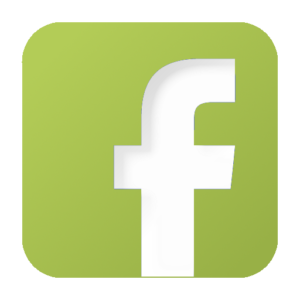 All of our ferrets are spayed or neutered and vaccinated as part of their adoption. If you'd like to adopt, please fill out an application. 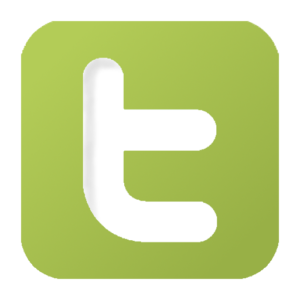 You can also reach us by email at GrandRiverRescue@hotmail.com.